If you need gift ideas for the Christian mom in your life then look no further. Or maybe you need to direct your hubby somewhere for ideas. 😉 Either way, keep reading for ideas to show appreciation to Christian moms for whatever the occasion may be. In this list you’ll mostly find ideas that will encourage the Christian mom in your life in her walk with God. But then, there are definitely some kinds of gifts that are just great ideas for ANY mom, not just Christian moms. So below you’ll find a few of those mixed in to the list too. Also feel free to leave a comment with your own ideas. I’ll definitely consider adding them to the list! If the Christian mom in your life is artsy, then some Bible journaling supplies might be a great gift idea for her. Bible journaling isn’t necessarily journaling words (although of course, it can be). But the term is more frequently being used to describe an art form of painting or drawing inspired art in your Bible that relates to a particular verse, theme, emotion, or idea inspired from scripture on that particular page. Some people also choose to keep separate Bible art journals not directly in their Bible too. There are all sorts of ways to do this, from Bibles that have scripture art in the margins that you can color with colored pencils, or simply using a wide margin Bible to draw or paint something from scratch. Either way, it’s a great way to grow deeper and closer in your walk with God and Christian mom’s who are more creative and artsy will greatly appreciate the supplies to get started. If she hasn’t heard of Bible journaling, I’d also recommend including this book in her supply kit to help her get started and get an idea for what Bible journaling is. There are so many awesome options for Christian jewelry out there that can remind the Christian mom you’re buying for of God all throughout the day. And it doesn’t have to be a cross necklace either. I love this armor of God charm bracelet or this these simple Bible verse bar necklaces. There are so many great options for all different kinds of styles. Or if she’s a fan of graphic tees, then another option is buying her a Christian t-shirt. There are pretty much endless options here. Even if these aren’t her cup of tea for wearing out, they would be great shirts to wear as comfortable pajamas. Along with Bible journaling, creating a war binder is becoming quite a popular concept (especially since the movie War Room came out). Basically a war binder is similar to a prayer journal. However, the difference is that it doesn’t only include prayers, but rather an entire “war tactic” for your life and those in your life. Including scripture, inspiration, prayers, etc. It’s a binder that you use to go to war against the struggles you (and those in your life) are facing, taking them to the Lord with all prayer and supplication. But even if the Christian mom in your life doesn’t want to start a war binder, prayer journal supplies would be another great alternative. A prayer journal is similar to a war binder (and some use it synonymously). As Christian moms, life gets hectic. And it can be all too easy to let life get in the way of remembering what’s most important: God. So having a Christian planner and/or calendar with scripture on it to remind us each day of the promises of God is such a nice thing to have. Personally, I absolutely love this wall calendar and have been using it for the past several years. Each month is a beautiful artwork for a verse and somehow for me personally the verse always pertains to whatever season of life we’re in as a family (not by coincidence, I’m sure). God is good! If the Christian mom you’re buying for has a Roku or watches shows/movies on her phone or tablet, then a subscription to a channel like PureFlix or the Dove Channel would be a great gift that keeps on giving to her. These channels have a wide array of Christian tv shows and movies that will help her to keep God on her thoughts even in her (not so frequent) down time. If you don’t think she’ll like one of these, then another alternative would be to just buy her a great Christian movie. You can find some ideas for some good ones linked to Amazon below. Or you can check out Christian Cinema for some other great ideas. A Christian book, devotional, or Bible study geared towards Christian women (or better yet moms) would be a great gift idea, especially for those Christian moms who like to read. If the Christian mom you’re buying for doesn’t have as much time for reading, then you can also consider getting her an audiobook or even a subscription to an audiobook service. I’m a big fan of Christian Audio. They have a great selection and members even get one free audiobook per month. I love scripture art because the Bible tells us to not only write God’s Word on our hearts, but also on the doorposts of our homes. So it’s a great way to do this in a modern way. It’s also nice because you can be reminded of scripture that speaks personally to you every day. There are a lot of different styles of scripture art out there from wooden signs to more of a shabby chic look, to more of a modern look. Whatever decorating style the Christian mom you’re buying for has, there is probably scripture art that will work for her. There are even scripture art printables that you can print from home and then frame in a frame you know she’ll like. You can check out my Etsy shop for some scripture art printable options. New books, Bible studies, journaling supplies, etc. are all nice, but what’s really great is having a fresh new Bible. Especially if she likes to write in her Bible, then having a clean slate to work with is always good to have every so often. There are so many great options out there. If the Christian mom you’re buying for likes to write in her Bible, then consider getting her a wide margin Bible. If she likes to color, then pickup one of these beautiful Bibles with scripture art to color right inside. Or if she likes a regular, no frills Bible, then there are lots of options for that too. No matter the case, a new Bible is a great gift idea for any Christian mom. Now this is a gift that would be great for any mom, not just Christian moms. But I had to throw it into this list, and here’s why. I love these style challenges as a Christian specifically because I really don’t want to be spending all of my time (or an exorbitant about of time) thinking about what the latest trends are or what things look good together fashion-wise. I’d much rather be spending my time on more important things. However, I do think it’s important to be good representatives of God both in the way we conduct ourselves and in the way we present ourselves. Because what’s outside (put together, not disheveled) should reflect what’s going on inside. I would note, however, for Christian moms to make sure that they adapt these style challenges to be modest, as modesty is so important for Christian women. But that is super easy to do as these style challenges are a formula, not a set-in-stone what to buy sort of thing. Like with Bible journaling and prayer journaling supplies, plain old Bible study supplies are a great gift idea for Christian moms too. Especially if you know that she likes to study her Bible a lot. You could pickup one of the women’s Bible studies mentioned above and then also some of these Bible study supplies too. Things like Bible safe highlighters, colorful pens, colored pencils, post it notes, etc. are all great things for the Christian mom who love Bible study. You can find some more ideas for Bible study supplies linked below. It seems like there’s a box subscription for anything you could possibly want these days from kids books to snack foods to makeup and more. And Christian subscription boxes are no exception. There are several options out there and this would be a wonderful gift for a Christian mom. One of the more popular ones is Faithbox. 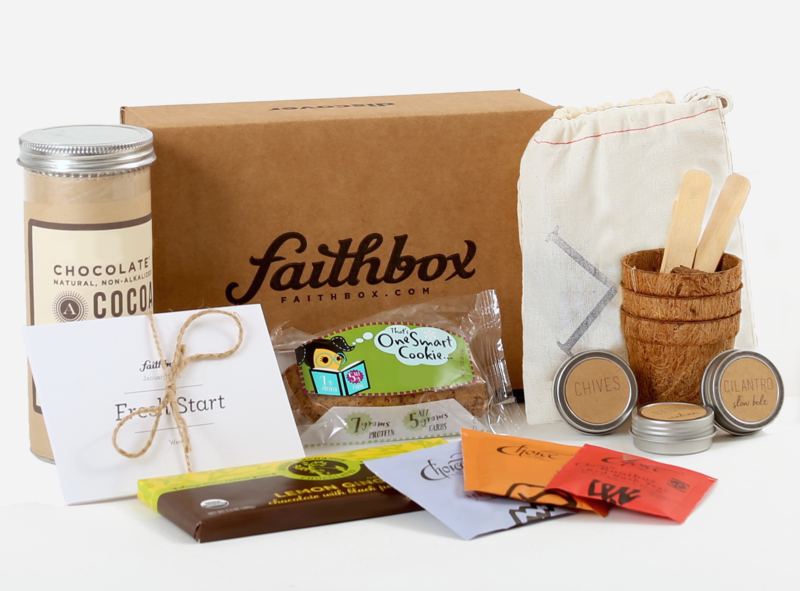 Every Faithbox is designed to help you end the month in a more Christ-centered way. Each one is created around an uplifting theme, like “transformation” for example. It includes Faithbox’s original daily devotional book, Everyday Faith, as well as other books and products that have a positive impact on the world. Click here to learn more about Faithbox, or click the image below. It’s amazing the things that are out there to keep God’s Word on your mind and heart these days. I love the idea of a mug with scripture on it because it can be a good reminder of what you should be doing first thing in the morning while you’re grabbing your cup of coffee: meeting with God. If there is an online or offline Bible conference that you know about, or even better one that you know she wants to attend, then pickup a ticket for her to go (or watch). With technology these days, there are so many great ones that pop up online, so even if she doesn’t have the time to go to one in person, she can watch one online. I’m a big fan of attending the Homemaking Ministries online Homemaking Conference each year. They also have a Bible study conference called the Enjoy the Word conference too. So the Christian mom in your life would love to have something like this that can help her to grow as a Christian and maybe even offer to watch the kids so she can spend a day watching (or going to) the conference too. What a great way that would be to present this awesome gift for Christian moms. And speaking of time alone, I have to mention this one. Of course, any mom, not just Christian moms, would love to have this gift. Because we all need some alone time, and mom’s tend to…well, not get this very much. This is especially great for new moms who still aren’t getting much sleep through the night. Flowers are certainly beautiful, but giving the Christian mom you’re buying for something that will last more than a week will be a special and most welcomed treat. Just keep in mind that Christian moms aren’t like other moms. Although there are certainly things that any mom would like (and I’ve included a few on this list), most Christian moms, more than anything, want to grow stronger in their walks with God so that they can, in turn, share God better with their children. Because with [wo]man this crazy hectic thing called motherhood seems impossible, but with God, this is possible! Have any other great gift ideas for Christian moms? I’d love to hear them. Feel free to leave a comment with your ideas below.